Hi all! It’s time for new challenges over at the YNS Blog! 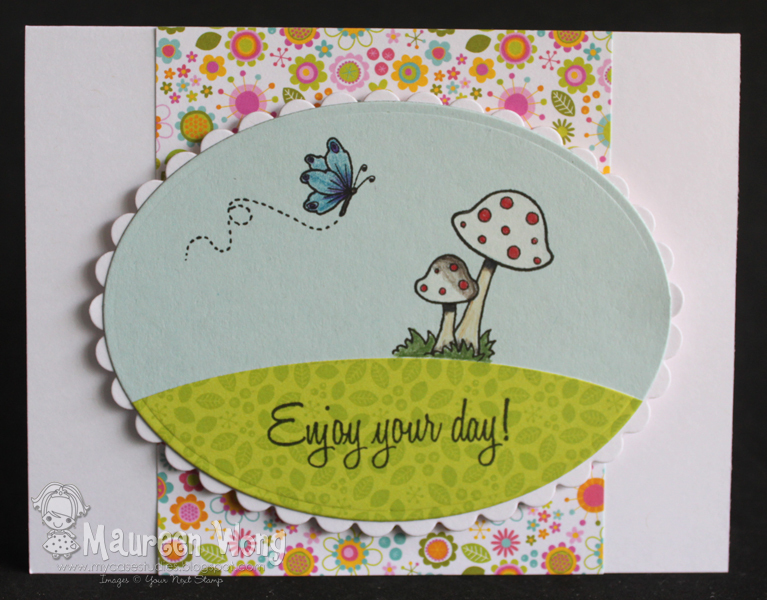 I used the set Sweet Spring Jessica and the grass hill die from the Spring/Summer Scene die set. The oval and scalloped oval are Nesties. I stamped on the blue cardstock and colored with my Luminance colored pencils. Then I mounted the grass hill and stamped the sentiment. Everything was stamped with my MISTI. 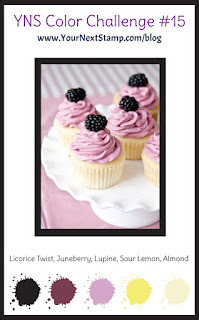 Please stop by the YNS Blog for all the details on the challenges and more inspiration from the DT! TFL! I went a little more simple and only accented 2 corners, but I love the way it came out! I used the little fox from Woodland Cuties and colored him with my new Luminance colored pencils. The green dotted paper is retired from A Muse Studio. And of course I used my MISTI to line up my image and sentiment and to overstamp my image with Versafine ink after I colored it. 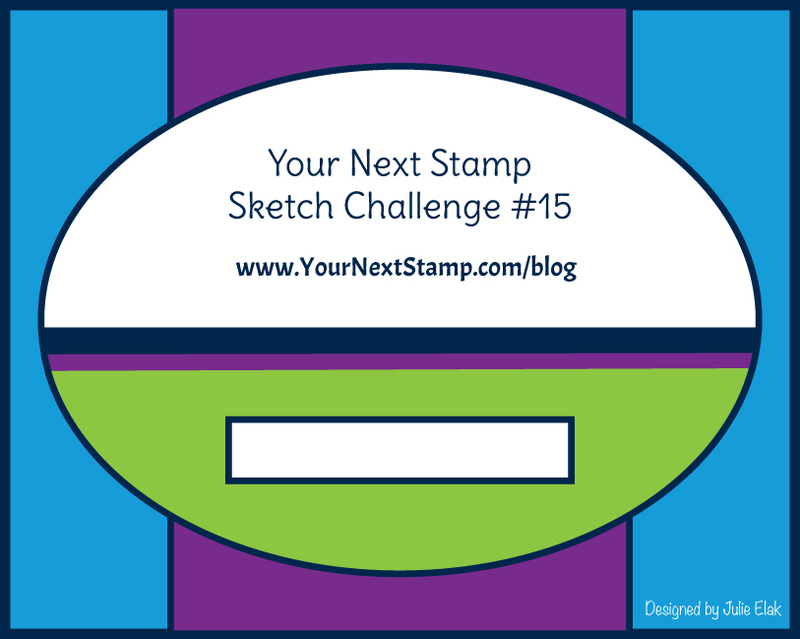 Please head over to the YNS Blog to see all the other creations from the DT and comment there for your chance to win a stamp set of your choice! TFL! I stamped the bottle from Soy Awesome with my MISTI and Memento black ink and colored it with Copics. I then put it back in my MISTI and overstamped with Versafine Onyx Black ink. Next I positioned the sentiment and stamped with dark brown ink to sort of match the soy sauce (or as we say it, shoyu). I die cut 2 pieces with the Stripe-tastic Rectangles die set (the use of these was inspired by Sue - thanks Sue!) out of toner cardstock that I made and foiled them with gold Deco Foil. I glued them on my card base, foam mounted the focal panel, and added Candy Apple Red Glittered Gumdrops to finish it off. I made a video, but it’s not quite ready yet, so I’ll have it up for the next Whatcha Watching? on Wednesday on the YNS Blog. Be sure to check out all the inspiration from the team, and we hope to see you playing along! TFL! I’m so happy with this release!! My favorite set is definitely the Woodland Cuties (although I haven’t used them YET), and because I’m Japanese and *love* sushi, I got a real kick out of Soy Awesome and Maki A Wish! I also have a new die perfect for making shaker cards - Confetti Die. Anyway, let’s get on to my projects, shall we? I used the Heart Ink Splatter with sour apple ink to be wasabi, and foiled the word wasabi in the sentiment with green Deco Foil. 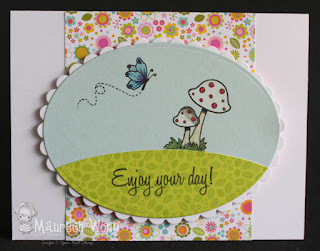 I used the MISTI to stamp the splatter and do the sentiment from Maki A Wish in parts. First I masked off the wasabi and inked the rest of the sentiment in black ink. Then I hit the whole thing with my heat gun to make sure the inks were fully dry. I also used my powder bag on the black parts to be extra sure! Then I masked off the rest of the sentiment and inked up wasabi with Versamark ink and stamped. I embossed with clear EP and heated. At this point I die cut the panel with the largest of the Stitched Rectangles. I didn’t want to run it through my die cut machine AFTER I foiled and take a chance that I would ruin the foil. Finally I covered the wasabi with a piece of green foil and ran the panel through my laminator. I left the foil on the panel while I applied my adhesive to the panel and stuck it to my sour apple card base. The very last step was to remove the foil piece. As always, we have a prize up for grabs! One lucky winner will be randomly chosen from all the comments on all the blogs in the hop, so the more you comment, the more chances you have to win (one comment per blog, please). That lucky winner will get a $20 YNS gift certificate! So now you’re off to Carole’s blog (link below), but before you go, don’t forget to leave me a comment! Happy hopping! I used only part of the new Treat Topper die set as a panel on my card. Then I used the Fancy Thanks die with some Pumpkin Deco Foil. I hope to see you back tomorrow for the New Release Hop! Until then, won’t you stop over at the YNS Blog to see a list of all the designers that have peeks for you today. TFL!